Making sure that your eyesight is as good as it can be should be a priority for us all. For so long we take it for granted and then suddenly we find that we can't read the instructions on the side of tins and cans or we have to hold the newspaper at arm's length. It is normally at this stage we realise that we need to get help and often don't want glasses so will consider having treatment that will give an extra few years before we need them. With BUPA eye surgery insurance it will not be long before you will have your eyesight as good as it used to be. BUPA is a health care provider that will let all customers chose to have their surgery in a clinic near to where they live. They have been in practice for 60 years and will be able to find a good surgeon to operate on cataracts. BUPA commission work in to other clinics and pay for them to carry out the operation. 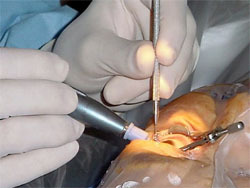 When BUPA arrange for cataract operations to be carried out they have found a lot of disparity in costs. They have been putting together a scheme to try and get similar costs at all clinics as they have found that they have been paying a great deal more for patients in one part of the country than they have been in another. This would not just be for the actual operation but also for the aftercare. The costs seem to have been put up as a result of an insurance company paying and the difference between the cost for an NHS operation and a private operation is immense. A consultation for a cataract operation can cost anything between £480 and £1,670 and there is no logical explanation why one should cost so much more than the other. In some cases patients are asked to pay in the region of £3,500 for an operation yet the same operation on the NHS would cost between £700 and £1,015. BUPA make use of clinics all over the country so it will be possible for a patient to get an operation carried out close to where they live. When the patient knows that they are going to have cataract surgery they will then need to decide where they will go. It will be easy to find out where the local clinic is as either you can phone to get information or check the clinic finder on the BUPA website. Choosing a clinic will be one of the most important things that you will do although BUPA will have their links with good clinics so wherever you go should have been checked out. As many charge a great deal more than the average it would be hoped that they will be providing an enhanced service. If they are, this will often include spending time in hospital although many places do not consider that this should be needed as long as it is only one eye that has been operated on.